Credit cards are a popular financing choice for small businesses. In fact, the National Small Business Association reports 31% of businesses surveyed for their NSBA annual economic report used credit cards to finance their business in 2017.
Credit cards that can help your business grow and prosper are critical. You should select the best credit cards to manage your business finances, earn rewards you can utilize, and provide perks and benefits to make business travel more comfortable and productive. No matter the size or nature of your business, selecting the right credit card is essential. But where do you start? We’ve put together a collection of the best business credit cards available — and sorted them by category so you can easily find the cards that will complement and support your business. This rewards card is the most appealing for businesses that travel frequently. Plus, its broad range of bonus earning categories is likely to pair nicely with your business spending patterns. The current 80,000 points sign up bonus is the best there is, in our opinion. That’s worth $1,000 when used for booking travel via Chase’s travel portal. For example, if you spent $50,000 per year in those bonus categories you’d earn 150,000 Chase Ultimate Rewards points. That’s worth $1,875 when used in Chase’s travel portal to book flights, hotels etc. But, those points are worth significantly more if you transfer those points to airline and hotel partners! Hot Tip: If you’re interested in learning more about rewards for advertising (Facebook, Google Ads, radio, etc.) check out this piece – The Best Business Credit Cards for Advertising Purchases. This rewards card is a clear leader if your business requires a lot of travel. Although the annual fee is steep, you’ll find plenty of benefits that more than offset the fee, including worldwide lounge access, airline and hotel credits, Uber credits, and a generous welcome bonus. An excellent choice if you’re looking for a no annual fee business card. A small business will fare well earning 5% cash-back on several bonus categories, and taking advantage of the 0% APR period can help your business finance a large purchase without costly interest charges. Bottom Line: Whether you’re looking for premium travel rewards, a broad range of bonus-earning business spending categories, or a no annual fee business credit card that earns rewards, one of these top business credit cards may be the perfect fit for your business. There are so many variables when it comes to credit cards, and business credit cards are no different. You’ll need to do a bit of research before selecting a business credit card. You will be personally responsible for paying the card unless your contract states otherwise. Your personal credit may play a significant role in whether you’re approved for a business credit card. The Federal Credit Card Accountability Responsibility and Disclosure (CARD) Act of 2009 set new provisions to protect consumers from some of the negative practices of credit card companies, but the CARD Act does not apply to business cards. Your business credit card may have higher fees and be less consumer-friendly, although many banks are now including CARD protections voluntarily on business cards. Credit limits are generally higher for business credit cards than for personal credit cards. Unfortunately, APRs can also be higher on business credit cards, a good reason not to carry high balances. Which are my most significant business expenses? You’ll want to select a card that rewards your most significant spending categories, ideally one that rewards all of your spending in those categories, not just a portion. What are my business travel requirements? Are you a road warrior who values rewards on gas purchases, an in-home business requiring no travel, or a frequent flyer who values premium travel benefits? Do you want to earn cash-back to reinvest in your business, or is earning travel rewards more of a priority? Do the redemption options for rewards add value to the business? With cash-back credit cards, the answer may be easy, but can your business benefit from free airline tickets if your business doesn’t require travel? However, it’s perfectly acceptable to use the rewards earned on business expenses for a personal vacation. Do I prefer a business card with no annual fee? While some high annual fee cards provide exceptional benefits, you might have a preference to stay clear of cards with high annual fees. Bottom Line: While it’s essential to select a business credit card that aligns with your expenses and priorities, it’s not a permanent decision. Try the card for a year and determine if it meets your needs. If the card doesn’t have an annual fee, you can hold on to it to build a longer credit history, or cancel your card if it has an annual fee, but doesn’t offer the value you want. You can then select a new, more fitting business credit card, but keep the Chase 5/24 Rule in mind. Limit of one 3% cash back bonus category. Many new businesses spend a lot on phone expenses, internet service and office supplies, so having a business credit card such as the Ink Business Cash℠ Credit Card that gives 5% cash-back in these categories could make it a good choice for a startup business. While earning rewards for business expenses is a perk, many new businesses have a priority of investing back into their business rather than taking a vacation using points or miles. A cash-back credit card such as the SimplyCash Plus Business Credit Card from American Express can put cash-back earned directly into your business. If your startup business has significant hiring needs, you’ll want to consider the American Express Business Gold Card that comes with an entire year of free recruiting services from ZipRecruiter. Services normally start at $249/month. Additionally, the card offers up to a year of free G Suite services which include video conferencing, cloud storage, and file sharing. If your startup can use either of these benefits, you’ll save big by having the American Express Business Gold Card. You’ll also be earning up to 4 Membership Rewards Points per $1 on select business spending categories that are your highest spending categories each statement period. The card does charge a $295 annual fee. Bottom Line: Startup businesses might have higher initial expenses in specific spending categories. The SimplyCash® Plus Business Credit Card from American Express and Ink Business Cash℠ Credit Card ensure accelerated earnings in specific categories. The American Express Business Gold Card has business bonus earning categories but also offers the additional benefit of free recruiting, video conference, storage and file sharing. Earn 2% cash back on the first $25,000 (combined) spent at gas stations and restaurants each year. 0% introductory APR for 12 months on purchases and balance transfers, then a variable APR of 15.49% - 21.49%. If your business requires frequent travel and you’re looking for a cash-back card, you’ll do well with the SimplyCash® Plus Business Credit Card from American Express, which offers travel as one of its 3% business spending bonus categories. The Ink Business Unlimited℠ Credit Card provides solid cash back benefits without having to keep track of special categories or quarterly bonuses. Every purchase you make earns 1.5% cash back that be invested directly back into your business operation. 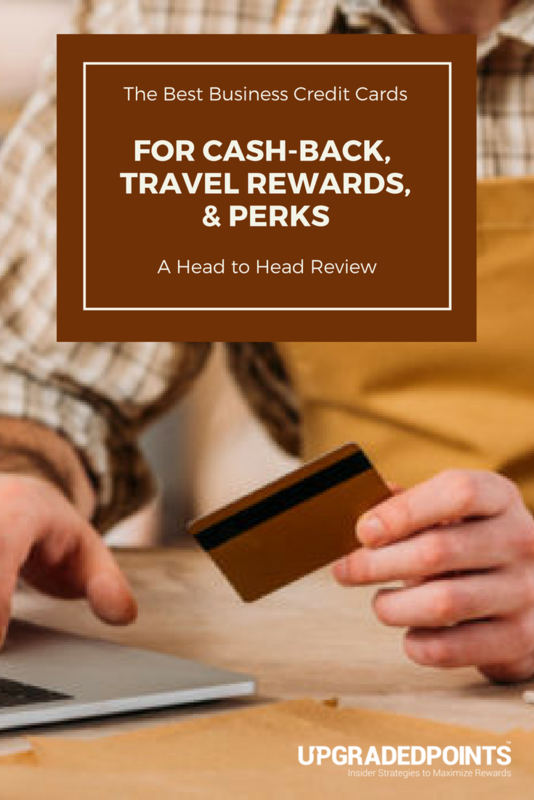 For businesses requiring a lot of road travel, the Bank of America Cash Rewards for Business Mastercard will earn 3% cash-back on all those purchases. You can’t beat 5% cash-back in several business expense categories such as office supplies, internet, cable, and phone services with the Ink Business Cash℠ Credit Card. Bottom Line: Cash-back is the most flexible reward you can earn as it can be invested right back into your business each statement period to help offset expenses and make your business revenue go further. Rewards currencies differ in value, so we’ve selected these business credit cards each earning a different rewards currency that you can use in a variety of ways that suit your business finances. Chase Ultimate Rewards earned on the Ink Business Preferred℠ Credit Card can be transferred to airline and hotel partners, redeemed for 25% more on travel through Chase Ultimate Rewards, or even redeemed for cash. The American Express® Business Gold Card earns Membership Rewards Points which you can redeem in several ways, but they bring the most value when transferred to one of the 20 hotel and airline partners. Last, but certainly not least, is the cash-back you’ll earn on the Ink Business Cash℠ Credit Card. Bottom Line: Rewards currencies vary in value, so you’ll want to make sure the rewards you’re earning on your business credit cards offer the best redemption valuable for your business. Bottom Line: Earning travel rewards on your business expenses is a fast way to accumulate points and miles that can be redeemed for free travel whether for a business trip or personal vacation. There aren’t many business credit cards that provide complimentary airport lounge access. Premium personal cards may make excellent alternatives if this benefit is valuable to you. The Citi®/AAdvantage® Executive® World Elite MasterCard® offers access to the American Airlines Admiral’s Clubs, and the Chase Sapphire Reserve® gives access to Priority Pass Select lounges. Bottom Line: If you have frequent business travel and lounge access is important to you, The Business Platinum® Card from American Express is an excellent choice. Again, you’ll find a steep annual fee — about enough for an annual lounge membership — but this card gives you access to several lounges for the effective price of just one. Earn 100,000 bonus Marriott Bonvoy points after you use your new Card to make $5,000 in purchases within the first 3 months. Bottom Line: If your business involves travel and you frequent a particular brand of airline or hotel, you’ll find value in a co-branded airline or hotel business credit card. Not only will you be earning rewards that can subsidize your business travel budget, but you’ll also enjoy perks and benefits that make travel more comfortable and productive. Business cards with 0% APR periods can help spread out the repayment of a large purchase or allow you to transfer balances from high-interest credit cards and pay off that debt without interest. Bottom Line: There are very few business credit cards that offer a 0% APR balance transfer period, and those that do typically charge a transfer fee. However, even with the fee, you may realize significant savings by transferring high-interest credit card balances and paying off debt within the 0% APR promotional period without interest charges. Bottom Line: You don’t need to pay an annual fee to find a credit card that earns rewards for your business spending. None of these 0% APR business cards charge an annual fee. Keep in mind there is an expiration date on the 0% APR. You should pay off your balance before the expiration so you won’t be subject to interest charges on any remaining balance when the 0% APR period ends. Bottom Line: A business credit card with a 0% APR period for purchases can help your business with cash flow as you spread out the repayment of a large purchase over time. If you need more information on these types of cards, read our post on the best 0% APR credit cards. Under that definition, a business can range from opening a restaurant to selling homemade jam or refereeing soccer on the weekends, as long as it has the reasonable expectation of earning a profit. Even if your side gig is small, it may still qualify for a business credit card because your personal credit will play a significant role in whether you get approved for a business credit card. Don’t lie. Provide information that is as accurate as possible. Relationships matter. Having other credit cards (with a positive history) or a bank account with the financial institution issuing the credit card will increase your chances of approval. If you have a banking relationship, for example, you may want to apply for the business credit card in person. Keep a copy of the application. If for any reason you are not approved, or if the issuing bank needs more information, you can refer to your application during any follow-up conversations. Make notes. On the copy of your application, make notes as to why you answered a question a certain way. Did you estimate your earnings? What was the process you used for the estimate? Take a screenshot of the offer. Before you hit submit, make sure you’ve documented the credit card offer. Applying for an offer that gives you 50,000 miles after your first purchase? Be sure you have a screenshot to refer to if those 50,000 miles don’t show up. Bottom Line: You can apply for a business credit card even if your business doesn’t yet have income. A strong personal credit history increases your chances of being approved. Consider applying in person at a local bank branch where you’ve done business. Some business owners question whether it’s necessary to have a business credit card for your startup or small business. It’s especially questionable if you’re not making a lot of money yet and you’ve been able to utilize your personal credit card for the expenses you’ve incurred so far. It’s prudent to separate business expenses from personal expenses, and it can become critical when it comes time to pay taxes or produce supporting information for an audit. An easy way to separate expenses is to open a bank account for your business and apply for a business credit card to use for your business-related purchases. Additionally, business credit cards frequently offer perks for businesses, have higher credit limits, and reward business category purchases more than personal cards. Knowing the difference between a charge card and a credit card can help you make an informed decision on which card fits your business spending patterns best. A credit card allows you to carry a balance from one statement period to another. You will be charged interest on any carryover balance. A charge card requires the balance to be paid off in full each statement period. 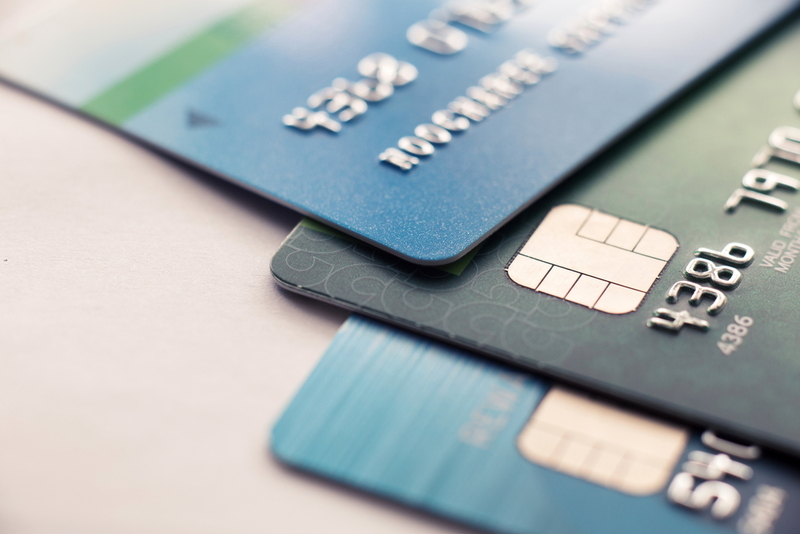 Charge cards may have offers that allow you to carry over a balance, but it is not guaranteed. The credit card issuer has to explicitly grant you this privilege. One advantage of a charge card is no specified spending limit, as the credit card issuer will determine this based on how you’re managing the card. Opening a business credit card is a positive step that supports the future growth of your business, and you do not need to have a large business to qualify. While this list of the best business credit cards is exhaustive, there are many more options available. Find the best business credit card for your business by researching the best available cards, their rewards and benefits, as well as drawbacks. A business credit card can make a big difference for your business and it’s critical to make an informed decision. One of the primary reasons for having a business credit card is to separate your business expenses from your personal expenses making it easier at tax time or to provide documentation in the case of an audit. Some business credit cards provide record keeping tools, syncing with Quickbooks and other financial management tools. Additionally, business credit cards may offer higher credit limits, free employee credit cards and earn bonuses in business spending categories that you won’t find on personal cards. You apply for a business credit card in your business name and all spending that relates to your business activity goes on the business credit card. Although you apply for a business credit card, your personal credit history can make a difference in whether you’re approved as you’ll normally be personally responsible for debt incurred on the card. Does opening a business credit card affect my personal credit score? Your personal credit history is normally taken into consideration and a hard pull inquiry is done on your personal credit report when you apply for a business credit card. While this might affect your personal credit by a few points initially, opening a business credit card may not affect your personal credit in the long term. If you default on your payments to the business credit card, however, the information will be reported to your personal credit report. Most business credit card issuers do not report activity to your personal credit report unless there is negative activity. There is no one best credit card for every business because benefits, rewards, and the value the business card adds to your business will vary. Reviewing the benefits of each card you’re considering and asking yourself if a benefit adds value to your business can help you select the perfect card. If you’re trying to keep costs to a minimum, for example, you might select a rewards-earning business card with no annual fee such as Ink Business Cash℠ Credit Card. Selecting a card with a 0% APR period for purchases and/or balance transfers may also be an option to help with your small business cash flow. The short answer is yes, but it is not prudent to do so because one of the primary benefits of opening a business credit card is to keep business and personal expenses separate. When personal expenses are put on a business credit card, you could run into problems at tax time trying to sort it all out and even have difficulty in case of an audit. Are business credit cards personally guaranteed? Yes, in most cases business credit cards are personally guaranteed and you will need to provide your personal information when applying for a business credit card so an inquiry can be done on your personal credit report. Are business credit cards hard to get? Generally, no. 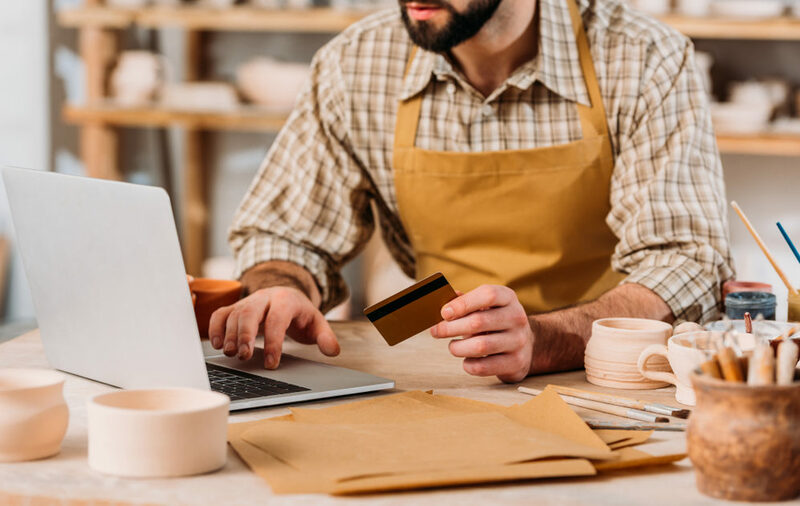 Even if you’re just starting out, with good or better personal credit, you can qualify for a business credit card as long as your business activity has the reasonable expectation of a profit. With that said, every credit card issuer has their own requirements for issuing business cards. Why would I want to use a business credit card? The primary reason to use a business credit card is to keep personal and business expenses separate. Combined with a business checking account, a business credit card can help establish your business as a formal entity. Can I get a business credit card even if my business doesn't make a profit? You can be approved for a business credit card even if your business does not yet have profits. You will need a strong personal credit history to be approved but it is possible to secure a business credit card without a profit. Just have to mention 2 business cards we are involved with and seem to get little / no mention on the web, but we think they are great (yes everyone’s needs are different). Capital One Spark – $60? Annual fee. A flat 2% back as cash, with no caps I think, awarded as soon as end of the month if you want. We take it as a credit back onto the account. Forget having to deal with this sector this quarter gets more, etc. Yes, we use citi Costco for 3% back on travel and restaurants and 4% on gas. 2 cards, pretty simple and nice $$ back. And the cutest perk – you can send in a picture as often as every 30 days and they print new credit cards with that picture : ). For our family business, we use family pictures on the cards (funny, it’s a business card perk but we use family / personal pics). And a Bank of America card my wife has from another business she is involved with. 1% back on all purchases. Not the best, but….each card holder gets those points rather than the account holder. The boss lets each card holder use the points they earned and keep the rewards. My experience w business card is that rewards are usually pooled to the account holder. Thanks for the feedback on the business credit cards you’re using as it sounds like you’ve found a combination of cards you’re happy with and that fit your situation. It also sounds like you’re having fun keeping those family photos updated on the cards.